2) Boredom with hearing folks in the metropolis across the Strait of Georgia crowing incessantly about how they could ski in the morning and golf in the afternoon. Just two sports, huh? Where the sea meets the land in the northeast corner of the Pacific Ocean, there exists a point of geographic and climatic confluence. At this place, mid-oceanic swells, having built up heads of steam during an eastward migration from the Aleutian Islands, crash into beaches of rock and sand, throwing salt spray into the rain forests at their margins. It is a place defined by water, where oceanic air meets the mountains growing out of the coastal forests, cools, and falls to Earth in quantities sufficient to send Noah to the shipyard. It is a place grown of pressure and fire, where the mountains cascading into the ocean wear craters on their summits, tipping their hands to their volcanic history. It is a place of sufficient latitude that in the winter those craters and their flanks are shrouded in snow, but at lower elevations the maritime influence causes the watersheds to rage with melt. It is a place of biogeoclimatic diversity, a place of beauty, a place of profound outdoor opportunity. It is a place of alchemy. At its best, it is a place called Vancouver Island. Across the Strait of Georgia, the metropolitan gem City of Vancouver draws deserving tourism industry attention through its natural assets and the gravity of its size. It is indeed a place where, as the propaganda heralds, you can golf in the morning and ski in the afternoon. With a little extra effort and creativity you could even add to your day’s activities, all within view of the city skyline. But what if you wanted to do even more; to see less of urbanity; to travel sunrise-to-sunset, sea to mountain to ocean, bagging outdoor activities as you traversed one of the planet’s most diversity-concentrated landmasses? You would introduce yourself to Vancouver Island. Then you would look for a weather and conditions window in the spring, gather up a friend or two and a whole bunch of gear, and take the golf-and-ski-in-a-day dream and bump it up a notch – or four – and spend a day completing a six-sport microadventure traverse across this island of outdoor opportunity. You would start with a stand-up paddle at dawn on the east coast; cross the island with stops to mountain bike, trail run, back-country ski and rock climb; and when you reached the west coast, end your day with a surf as the sun descends into the sea. And you would call that day: tomorrow. The plan originally was to do it quietly, likely solo, and tell the story afterwards through my own words and images. Where did that go “wrong”? 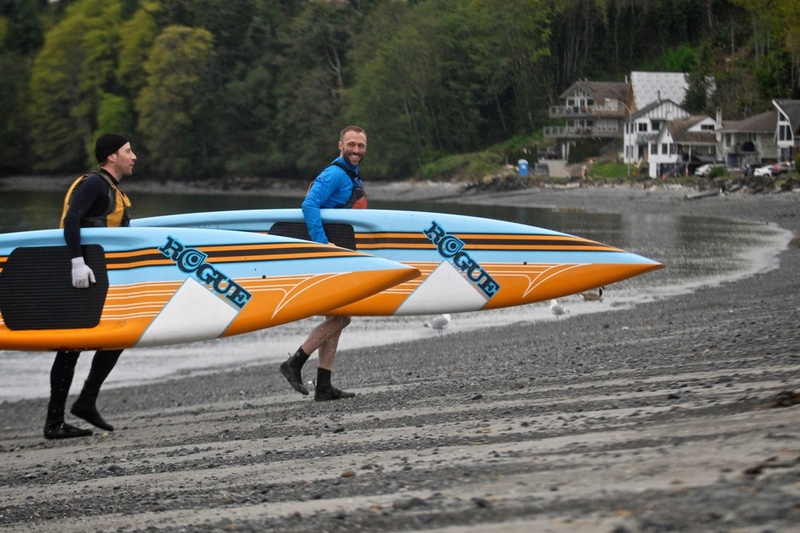 I made the mistake of asking my buddy Norm if he’d like to join me for the first activity, the stand-up paddle, given I was planning to do it in his hometown Nanaimo. 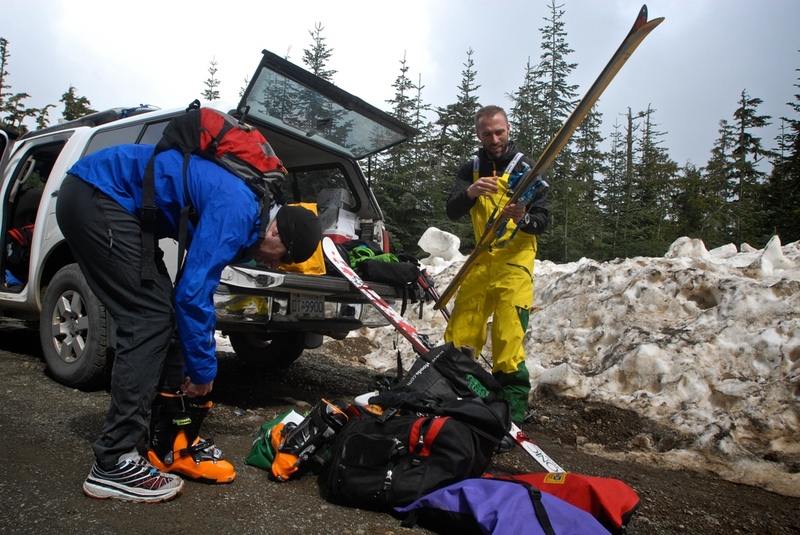 You see, Norm’s a keener, and so when he said yes it wasn’t to the paddle, but to joining for the whole shebang, never mind that he’d never in his life backcountry skied…etcetera. (You have to respect someone willing to tee up something like this on the drop of a hat and almost zero preparation.) The other thing about Norm’s keenness: it’s infectious - more accurately, he willfully spreads it broadly. First, he infected photographer, Krista Bryce; hours later, videographer, Pella Gustavs, was also along for the journey. All the company made for a very different experience - including the oddness of me hardly ever pulling out my own camera given there were so many others around - a noisier, more outward-focused experience, but given the noise was owing to stories shared and laughter exchanged over the course of a very long day, it was - they were - an experience I appreciated. So my thanks to photographer, Krista Bryce and videographer, Pelle Gustavs, for chasing us around all day so that we could have these visual souvenirs of our experience. According to this Law, as the personal space available to each stranger in a traveling group decreases, the amount of pressure exerted on the group increases, linearly. Consider for the purposes of illustration a mid-sized pick-up truck: Add to the truck four previously unassociated individuals. Now pile in two mountain bikes and associated paraphernalia, two stand-up paddle-boards and paddles, two surfboards, two wetsuits, two complete sets of back-country skis/skins/boots/poles/packs, four running shoes, two sets of climbing equipment, full complements of professional photography and videography equipment, the overabundance of technical apparel necessary to carry out these six activities, and enough food and water to fuel the participants over the course of a 22 hour day. Do this and by all rights - as well as the laws of physics as stated dispassionately in the above equation - at some point in that very long day spent driving winding roads up, down and across an entire land mass, stopping along the way to complete activities that in each instance returned two of the individuals involved back to the experimental system - the truck - in a wetter, smellier and in some cases more bloodied and broken-down state than when they left, at least one of the stranger’s heads should explode and all hell break loose (which, consequently, is also explain by the Ideal Gas Law: see T, temperature). Last Sunday that experiment was my reality when Normon Thibault (in fact an old friend - grant me a little poetic licence), videographer Pelle Gustavs and photographer Krista Bryce met before sunrise to cross Vancouver Island from east to west, dawn to dusk, sampling along the way six of this wild isle’s amazing outdoor opportunities. I’m very happy to report that, somehow, along the way we were able to break the Laws of the Universe and return home with our heads intact and hell’s fury averted. In fact, I think we may have even consolidated a few new friendships within that funkier-as-the-day-progressed four-wheeled pressure cooker. We sure as hell had a lot of fun. For a visual retelling, see Pelle's video edit above and Krista’s photoessay from the day (posted in the Nanaimo Daily News) in the gallery below. Comrades Norm Thibault of Nanaimo and Rumon Carter of Victoria divided the day into six mini-adventures that stretched from coast to coast. Their mission was threefold - to showcase the varied recreational opportunities within the 208-kilometre stretch from Nanaimo to Tofino; to inspire residents to get out into their backyard and enjoy what the island has to offer for free; and to show there is more opportunity for tourism initiatives to highlight the island’s unique terrain through recreational sport.